A family-owned corporation since 1992, established to fill the need for a full-service marine dealership in the northwest area of the Dallas-Ft Worth Metroplex. We are proud to be Suzuki Marine Retail Outlet since 1994. We are a premier dealer with the largest Suzuki parts and accessories inventory in North Texas. We have repower specialist with the expertise in installing new technology motors on older boats. In addition to our superior service for Suzuki, we are well versed in Volvo Penta, OMC Cobra and Mercruiser stern drive systems as well as Indmar Performance Inboard engines. 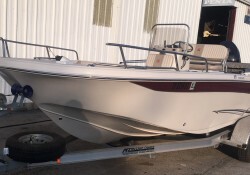 Our specialty is Carolina Skiff/Sea Chaser center console boats as well as SeaArk aluminium fishing and pleasure boats. Our well-trained service staff has accumulated experiences of over 100 years. We are committed to the industry by honoring an annual training program for our technicians. With this training we stay current in the skills required for top maintenance of today's high-performance and technically innovated engines. Our goal and commitment is to provide our customers with prompt, personal and professional repairs.